The following announcement came from the Department of Justice regarding withdrawn ADA technical guidance. The Document speaks itself. As you know Technical Assistance guidance does not overrule Statutes, regulations, or caselaw. Please evaluate and distribute the document as you believe appropriate. The State of Kansas will continue to comply with its ADA obligations and commitments. 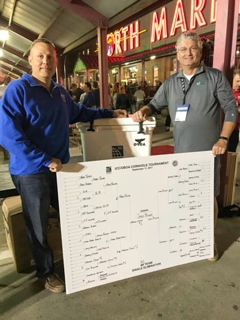 Curtis Deines, North West Director and Brian Hunt, Chapter Treasurer teamed up during the Welcome to Columbus Tailgate event to compete in the ICC Corn Hole tournament. While the Naked Karate Girls preformed in the background, Curtis & Brian pitch and tossed their way to top. Bring home the top Honors as ICC Corn Hole Champions.